Bank War: Andrew Jackson was the 7th American President who served in office from March 4, 1829 to March 4, 1837. One of the important events during his presidency was the extension of the "Bank War". Summary and definition: What was the Bank War of 1832? The Bank War was the name given to the events initiated by Andrew Jackson to bring about the destruction of the Second Bank of the United States and transfer government money into selected state banks. The Bank War was a bitter and personal dispute between Jackson and his enemies. Jackson succeeded in his determination to destroy the Second Bank of the United States but deposits of government money into the "Pet Banks" resulted in the Specie Circular which dried up credit and ultimately led to the Panic of 1837. The War of 1812 had helped to nurture an exuberant sense of nationalism in the country. The nation entered a period of confidence and economic growth. A great three-part economic plan called the American System was initiated by Henry Clay to meet the requirements of the expanding nation. The 'American System' was designed to see American trade flourish. Money was made available for the industrialists to build factories in the east and to buy land and start farms in the west. A transport system was to be built enabling people to move westward. A key factor in this economic plan was the establishment of the Second Bank of the United States to provide easy credit to Americans to enable them to improve their lives. The 20% of the Second Bank of the United States was owned by the United States government whilst private investors owned the rest. It was therefore still a privately held banking corporation. A charter for the Second Bank was signed into law by President Madison on April 10, 1816. The bank's charter was for twenty years expiring in 1836. Within three years the country was hit by the economic catastrophe referred to as the Panic of 1819. The panic of 1819 was part of a worldwide financial crisis but many of the problems experienced in the U.S. were caused by the Second Bank of the United States. The Second Bank of the United States was directed under extremely poor management - at the time banks were unregulated. The first president was a man called William Jones whose merchant business had gone bankrupt early in his career. He moved into politics and became Secretary of the Navy and later Secretary of the Treasury. His service as Secretary of the Treasury was marked by mismanagement of finances. But he was 'one of the boys' and appointed the banking president (refer to the Spoils System). His record of mismanaging finances continued in his new role. The bank itself was involved in speculation during the land boom and credit was recklessly extended to people without collateral. The financial bubble burst and Jones then rescinded credit too quickly resulting in the Panic of 1819. The history of the Bank War was therefore rooted in the mismanagement of the Second Bank of the United States and the Panic of 1819 that was followed by a two year depression which had devastating effects on the nation. The incompetent William Jones was replaced by a new president called Langdon Cheves, a politician and attorney from South Carolina. Langdon Cheves wasn't much better than Jones and his actions added to the plight of the people. Cheves resigned in 1823 and was replaced by Nicholas Biddle. He was a much better choice. Nicholas Biddle was a wealthy politician from Philadelphia who had already served on the Board of Directors at the Second Bank. Nicholas Biddle also had the highly influential backing of politicians such as Henry Clay and John C. Calhoun. It should also be pointed out that 40 members of Congress held stock in the bank. The memory of the Panic of 1819 was burned into the memory of Andrew Jackson. The effects of the Panic of 1819 had fostered a profound mistrust of banks, bankers and paper money in the minds of Andrew Jackson and many of his fellow Americans. They had either witnessed, or experienced, foreclosures by the banks, bankruptcies resulting in the loss of land, homes and livelihoods, unemployment, rampant inflation, the inability to obtain credit, the decimation of land values and over crowded debtors prisons. Andrew Jackson had experienced the damage caused by banks at first hand. He had accepted paper promissory notes for the sale his land. The buyers went bankrupt, the notes became worthless and Jackson only just survived financial ruin. He would never place his trust in bank notes (specie) again - he believed payments should be made in gold or silver coinage. His experience also gave him the belief that nothing should be bought on credit - people should only spend what they had. Andrew Jackson was elected President and began his presidency on March 4, 1829 - he swore to bring about the destruction of the Second Bank of the United States. The Bank War began. There were additional reasons for his pledge. The bank was large in size, having 25 branches across the country. It was powerful and, under the competent management of Nicholas Biddle, was growing prosperous. In addition the stockholders and managers, for the most part, were his political opponents. Moreover, the Second Bank of the United States was unregulated and also seriously interfered with the operations of the state banks, some of which were managed by friends of Jackson. Jackson's Bank War was supported by many people. The bank's charter was due to expire in 1836. In his first message to Congress, Andrew Jackson gave notice that he would not give his consent to a new charter. 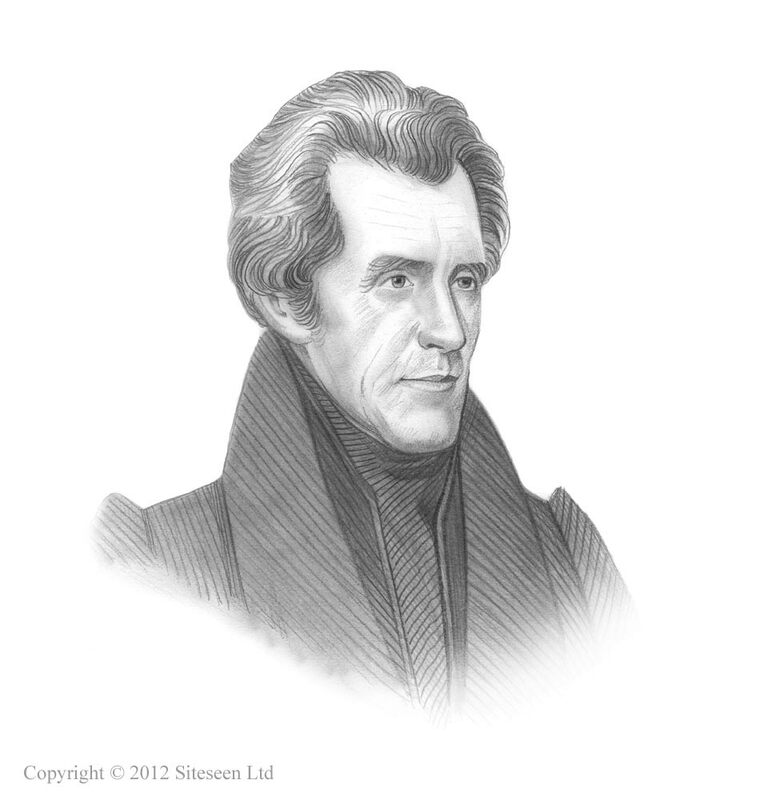 However, as Jackson was elected in 1829 his term in office would come to an end in 1833. His political opponents, led by Henry Clay and John Quincy Adams, and including the 40 Congressmen who held stock in the bank, regarded his message as a challenge. In 1832 a request was submitted to Congress to renew the charter four years before the charter was due to expire. A bill was passed by Congress re-chartering the bank. Jackson vetoed the bill on July 10, 1832. The opposition were unable to obtain get enough votes to pass it over his veto. The bank war, therefore, became one of the issues of the election of 1832. Andrew Jackson was re-elected by a large majority over Henry Clay. The President took his majority as clear confirmation that the American people believed in his war against the national banking system. At this period in American history there was not a Treasury building at Washington, with great vaults for the storage of gold, silver, and paper money. There were no sub-treasuries in the important commercial cities. The Second Bank of the United States and its branches received the government's money on deposit and paid it out on checks signed by the appropriate government official. In 1833 the Second Bank of the United States had about $9 million belonging to the government. President Andrew Jackson directed that this money should be drawn out as required, to pay the government's expenses, and that no more government money should be deposited in the bank. All future deposits were to made in certain state banks - those that were controlled by Jackson's political friends and referred to as the 'Pet Banks'. Large deposits of government money was deposited in the 'Pet Banks'. But there was a problem. "Wildcat Banks" sprang up in the West where there was considerable land speculation. And some of the managers of the "Pet Banks" were tempted to lend money more freely. Jackson knew this was lead to yet another financial disaster unless he took action. He therefore issued a circular to the United States land officers. This circular was called the Specie Circular, because in it President Jackson forbade the land officers to receive anything except gold and silver and certain certificates in payment for the public lands. What were the Effects of the Bank War? The effects of the Bank War was the Payment of the national debt. By 1837 the national debt had all been paid. This led to a financial dilemma. The government was collecting more money than it could use for national purposes which led to a surplus. The government had more money in the "pet banks" than was deemed safe. But it was unable to reduce taxes because of the 1833 Compromise Tariff that had been adopted to defuse the gravity of the Nullification Crisis. The Compromise Tariff made it impossible to reduce duties any faster than a certain amount each year and to repeal the Compromise Tariff would lead to bitter conflict between the North and South. However, the problem of the surplus revenues was not Andrew Jackson's - this would be tackled by the next President Martin Van Buren. What was the Significance of the Bank War? The financial problems that crippled the economy of the United States included the Panic of 1819, the Panic of 1837 and the Panic of 1857.